Abuse victim advocate Manny Waks outside Yeshivah College in St Kilda East. 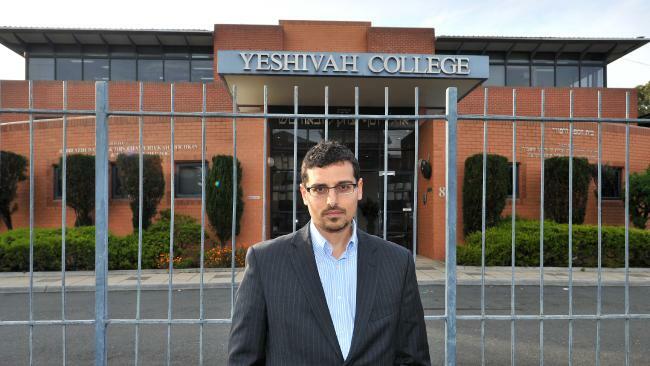 MELBOURNE’S Yeshivah Centre has today agreed to compensate sexual abuse victims up to $80,000 each. The Orthodox Jewish centre has set up an independent panel to determine the amount of payments made to victims on a case-by-case basis, with payouts dependant on whether a victim is deemed to have suffered significant abuse ($10,000 to $20,000), severe abuse ($20,000-$50,000) or extreme abuse ($50,000-$80,000). Centre spokesman Yechiel Belfer wrote to the Jewish community to inform them of the redress scheme. “The scheme has been established to ensure that these wrongs committed against children will no longer go unnoticed or unacknowledged,” Mr Belfer wrote. Abuse victim advocate Manny Waks, who was sexually abused at the Yeshivah College when he was 11-years-old and reported it to the Yeshivah leadership in 1996, said today’s announcement was long overdue. “It’s a big relief,” Mr Waks said. “This has been a long time coming. Mr Waks said the long-term impact of child sexual abuse had been well documented. He said the process could have been completed “with a lot less pain and suffering for so many people”. “Often it’s not only the sexual abuse itself that leads to trauma, but also the secondary abuse brought on by the institution’s response — the cover-ups and intimidation — which often is worse than the primary abuse,” he said. “There’s no doubt that many of us have been traumatised and re-traumatised by Yeshivah’s actions and inactions. Any person aged under 18 who was abused by an employee, volunteer or students of the centre, its Beth Rikvah colleges and youth centre or associated community activities are encouraged to come forward and seek compensation under the scheme. Victims must show the panel it was reasonably likely they were abused. Counselling and personal apologies are included in the scheme. The Yeshivah Centre will hold a community event to discuss the sexual abuse on Wednesday at 7pm. ​Originally published at Herald Sun.